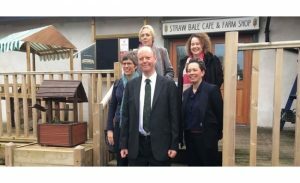 Professor Chris Whitty, the National Institute of Health Research (NIHR) lead, recently met with Salford experts in Public Health to learn about their research experiences. Professor Penny Cook and Liz Burns, were recent guests of the Chief Scientific Advisor who was interested in the CICA programme and their findings. 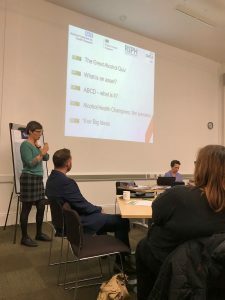 Professor Dame Anne Johnson, Chair of UK Strategic Co-ordinating Body for Health of the Public Research, and Honorary Professor Kate Ardern, Lead Director of Public Health for Greater Manchester for Alcohol and Drugs, also took part in the event. Significantly, they met at Greenslate Community Farm in Wigan. Greenslate Community Farm is a farm build and run by the community. It is the setting for an innovative rehabilitation programme. Here, people in recovery from alcohol and substance use can volunteer as part of their recovery journey. After a tour of the farm, Chris and Penny discussed the University of Salford’s five-year NIHR funded evaluation programme. Together, they reflected on the process from funding announcement, through bid development, to delivery of the research. A substantial area of interest was how to engage communities in public health research. Chris was keen to gauge Penny’s opinion on the NIHR Public Health Research Programme. He was interested to know what the NIHR could do to encourage more funding applications to evaluate community-based interventions like CICA, particularly those that benefit the most health-deprived populations in the north. The pioneering CICA model trains local volunteers to become accredited ‘Alcohol Health Champions’. The champions are then able to advise family, friends and colleagues to rethink their drinking habits with the aim of reducing alcohol harm across Greater Manchester. The University of Salford, with the University of Bristol and the University of York, have received funding from the NIHR to carry out outcome, cost-consequences and process analyses of the CICA scheme. 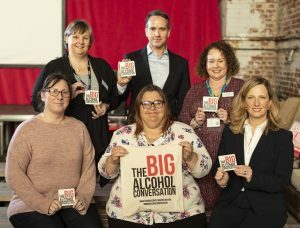 On Thursday 15 November 2018, the CICA Alcohol Health Champions took a leading role at the launch of Greater Manchester’s The Big Alcohol Conversation. 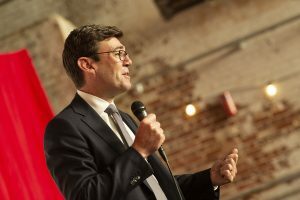 They shared the stage with the Mayor of Greater Manchester, Andy Burnham, Jon Rouse (Chief Officer of Greater Manchester Health and Social Care Partnership), Sarah Price (Executive Lead Population Health and Commissioning GMHSCP) and Honorary Professor Kate Ardern (Lead Director of Public Health for Greater Manchester for Alcohol and Drugs). What is The Big Alcohol Conversation? The Big Alcohol Conversation is designed to be the biggest ever dialogue about alcohol with the people of Greater Manchester (GM). 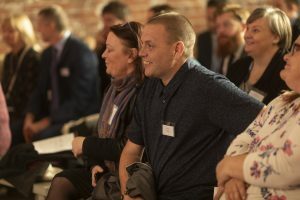 It is being led by the Greater Manchester Combined Authority (GMCA) and Greater Manchester Health and Social Care Partnership who are working to achieve significant improvement in the health and well-being of the region..
Who was involved in the launch? Jon Rouse opened up the Big Alcohol Conversation and shared his own personal story about alcohol. He acknowledged, “we all have a story to tell”. He emphasised the need for honest and open conversations about alcohol and its impact on our communities. The impact of parental alcohol use on children’s lives is a major talking point within the Big Alcohol Conversation. Sarah Price spoke about alcohol’s hidden harm in families. She outlined that over 45,000 children are estimated to be living with parents or carers who binge drink and over 33,000 children live with parents or carers who are alcohol dependent. Anna, an adoptive mother of a child with Foetal Alcohol Spectrum Disorder (FASD), then shared her experience of the lack of awareness, under recognition, and lack of support that is available for children and families living with FASD. She demonstrated the impact of people power and local community lobbying for alcohol change. GM’s long-term aim is to eliminate new cases of Foetal Alcohol Spectrum Disorder. Hon Prof Kate Ardern emphasised the case for citizen public health as part of the GM Big Alcohol Conversation. She introduced Communities in Charge of Alcohol (CICA) as a ‘social movement’ and not a programme or project. One of the first ever Alcohol Health Champions from Salford then took to the stage to share his own story. James spoke about how he wanted to use his knowledge to give something back, using his own experience to help guide others. As a result of his own journey, he has re-established relationships with his four sons – a part of his life that he thought he would never regain. Kate Ardern then invited three Alcohol Health Champions to join her on stage along with Liz Burns from the University of Salford CICA research team. 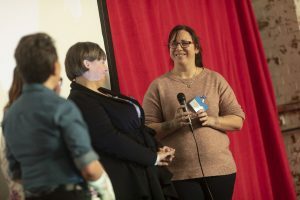 The champions took one question each and spoke in turn about what motivated them to become an Alcohol Health Champion, what they have gained from being an Alcohol Health Champion and who can become an Alcohol Health Champion: “absolutely anyone who wants to can become a champion”. 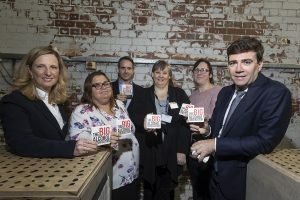 Finally, the Mayor of Greater Manchester Andy Burnham brought the event to a close by officially launching the Big Alcohol Conversation. The Big Alcohol Conversation will run until the end of February 2019. The aim of this three-month long campaign is to engage citizens of GM in conversations about the local scale and nature of alcohol harm and explore potential options to tackle it. The Mayor said, “I’m not here to lecture anyone. This cuts across all classes and speaks to everyone. This has to be a conversation. There are no easy answers but it’s an issue that needs to be talked about and understood”. Findings from surveys, interviews and focus groups will accumulate into the development of a Greater Manchester ‘Ambition for Alcohol’. Almost a year to the day since Communities in Charge of Alcohol (CICA) first rolled out across Greater Manchester, the University of Salford research team had the pleasure of running an ESRC Festival event in Manchester’s vibrant city centre. Our twilight session, on Tuesday 6 November 2018, was attended by pioneering alcohol health champions from Salford, local CICA leads from Bury and Tameside, as well as community guardians from South Manchester. The event was hosted in partnership with Jan Hopkins (CICA project lead) from Greater Manchester Health and Social Care Partnership (GMHSCP). 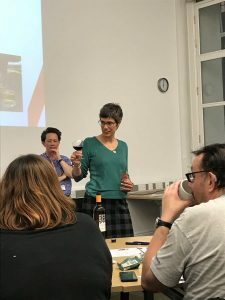 Lead researcher Professor Penny Cook opened the event which began with a little bit of a taster of the alcohol health champion training course: the Great Alcohol Quiz. One of the assumptions of the Communities in Charge of Alcohol programme is that communities have existing strengths, motivations and skills that can be used to make positive changes which benefit everyone. The opportunity to gain an accredited RSPH Level 2 alcohol health champion qualification aims to increase confidence at a personal level, and impact directly on alcohol-related harm through large-scale community action. Alcohol health champions start their journey by clarifying myths about alcohol so that with the right information they can go on to offer brief alcohol advice and influence local licensing decisions in their communities of interest. Our Great Alcohol Quiz focused on five big myths. 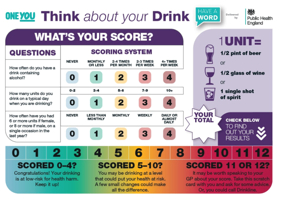 These surrounded old advertising, current licensing laws, unit awareness, calorie content, and the estimated ‘numbers needed to treat’ (NNT) in order for one person to significantly reduce their alcohol use as a result of brief advice. The drink-pouring exercise brought home the message that one drink is rarely one unit these days. In recent times, drinks have got stronger and measures have got larger – especially the ones we pour at home. Can your pour one unit? ABCD – what is it? Another major assumption of CICA is the use of an ‘asset based community development’ (ABCD) approach. By strengthening and building social factors (or assets) that protect and maintain health and wellbeing, CICA in turn should strengthen and build personal and community resilience[i] . 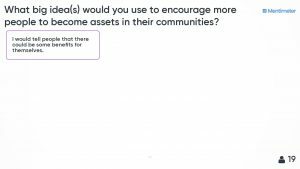 Before sharing what we already knew about ABCD’s underpinning theory of salutogenesis[ii], we asked our audience for their own definition of an asset. Our audience had individual and shared perceptions of how positive health can be created and maintained using a wide range of assets, including: People; History; Skills; Salary/finance; Culture; Passion; Goals; Ideas; Buildings. A highlight of the evening was the first showing of our feature length film: Communities in Charge of Alcohol – the story so far. Co-created with alcohol health champions from across Greater Manchester, the video gives an in-depth look at the CICA intervention from its conception to roll-out. It includes interviews with volunteer champions themselves, as well as insights provided by CICA co-ordinators. 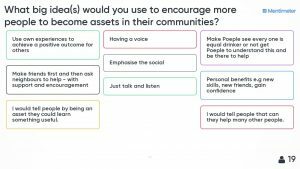 We closed our 2018 ERSC Festival event by posing the question: what big ideas would you use to encourage more people to become assets in their own communities? There were many! [i] Public Health England 2015. A guide to community-centred approaches for health and wellbeing. [ii] Lindström B, Eriksson M. Salutogenesis. Journal of Epidemiology and Community Health. 2005;59 (6):440-2.